Al thing shal be wele. ... al manner of thing shall be wele. and at the last end thus halt verily sen it in fulhede of joye. Usłysz głosy, napełn myśli człowiecze. Hear our voices, fulfill mankind's intentions. po żywocie rajski przebyt. And after life, Paradise. All things shall be well. ... all manner of things shall be well. Have faith, and have trust, and at the last day you shall see it all transformed into great joy. 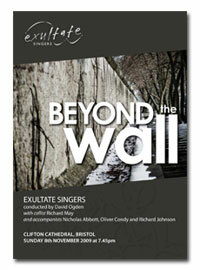 Please request permission before reproducing any programme notes or content from the pdf above, by emailing info@exultatesingers.org.